Rich soil with plenty of compost added. Often grown in widely spaced enriched hills, or in well-aged compost heaps that include some soil. Corn, Radish, Mint, Marigold and Nasturtium. Sow seeds 1 inch deep in rows, or in hills spaced 6 feet apart. After 2 weeks, thin to 2 plants per hill. To prevent insect problems and encourage early growth, cover seedlings with row cover (fleece) tunnels until they begin to bloom. 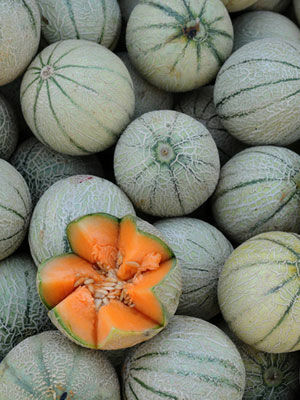 Fruit size, flesh color and texture varies with variety and type of melon. Fast-growing muskmelons often do best where summers are cool and rainy, while warm, dry climates favor smooth-skinned honeydews. Small melons mature quickly and take up less space compared to varieties that produce huge fruits. Many muskmelons and cantaloupes separate naturally from the stem when the melons are ripe, so they come away from the vine with only a gentle tug. Melons that do not “slip” often sound hollow when tapped, and the skin color takes on a yellowish cast. Wipe harvested melons clean and store indoors in a cool place, or in the refrigerator. Use a paper or other roll-out mulch to prevent weeds. Do not weed after the fruits have set. In the US, melons are at high risk for damage from squash bugs, squash vine borers, cucumber beetles and bacterial wilt, so using row cover is a wise preventive strategy.